I've said it many times in the past. Every week, once a week, no matter how bad a week you're having...Wednesday is a little slice of nirvana. Because, even if you're strapped for cash (as I will be, soon, I'd imagine), you have an excuse to mosey on down to the local comics shop and browse the shelves. Take a gander at the new books, the new toys, the new whatever that thing is behind the counter with the $300 price tag. Maybe it's a replica alien head from a 1970s TV show you never even knew existed. Still, the simple fact that someone made it, and the fact that, more than likely, it'll be in some nerd's living room by the end of the day has to make even most cynical among us stop and smile. (And, hey, bonus points to me for using the words "mosey" and "gander" in the same post). So, yeah, for all those wondering. This week, I am going to spend normally, and buy what I want. Next week? Probably the same deal. The following week? Um, no. Not if I'm still unemployed. So, let's hope I land something before then, because I needs my comics. Truth be told, the only time that I kept a bit of sanity this past weekend was on Sunday, when I sat down to read my pile of books from weeks (and months) past. I figure, as long as I don't burn through my unread books at too quick a pace, I can buy less and less each week, and still have something to look forward to reading. 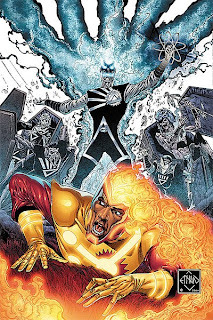 That said, this week sees the latest release of DC's big event, Blackest Night, with issue three. As I've said, I never really liked Green Lantern. Hal Jordarn, Jon Stewart, Kyle Rayner...eh. Who cares? Never me. But now, with Geoff Johns writing the pants off this title, I am 100% hooked on GL. What a great storyline! I'm a fan of horror, and boviously, superheroes, and this book delivers on both. The interiors by Ivan Reis are some of the best work being done in mainstream comics, and I highly suggest you check this series out. As the dead attack in full force, Green Lantern is faced with an impossible decision and the scattered remains of the Justice League suffer a terrible loss. Who can stop the Black Lanterns? Why are they rising? And how can the Spectre help? Next up, we have a book that I ordered from Diamond a couple months back, and I am really looking forward to. From Dark Horse, issue one of Beasts of Burden hits today. As an aside, I have to say that Dark Horse has become, hands down, my favorite comics publisher. From The Goon to Hellboy to BPRD to Buffy to Witchfinder, Solomon Kane to Conan, and all of the great one-shots and limited series they release, the publisher is just outstanding. Their material is always new, and fresh, and their comics are just flat-out good. When it comes to the kind of books I like the most, it seems as though Dark Horse has one or two that are right up my alley every week. What I really love about Dark Horse, though, is the fact that you can pick up most any title in their catalogue, read it, understand what the heck's going on, and become a fan of the title. Their series are all collected in trades that are numbered in a logical (easy-to-follow, numerical) order, and there aren't a million different incarnations of each of their characters. Actually, there's only one version of each character, as each title (except for their Star Wars adaptations) is written by the person who owns those characters. Powell on Goon, Mignola on Hellboy, Whedon on Buffy, and so on. Dark Horse keeps things simple, and straightforward when it comes to the streamlined nature of their titles. But, they manage to produce some of the highest quality, most thought-provoking books in an industry where "I punch your face!" is all too common. So it is with that preamble that I say the following. I have every faith that Beasts of Burden, from creators Evan Dorkin and Jill Thompson, will be another must-read addition to the Dark Horse catalogue. Written by comix legend Dorkin, and beautifully painted by one of the greats in the industry, Jill Thompson, Beasts tells the story of a group of (talking) animals who must investigate the supernatural goings-on in their hometown. These characters have appeared before, but you'll not need any previous knowledge of them going into this series. That's just how Dark Horse rolls. Anyway, each page is fully painted by Thompson, and the book clocks in with a downright cheap price tag of $2.99. Here's the full blurb from Dark Horse, and be sure to check out the free preview on their site, right here. When supernatural occurrences sweep the community of Burden Hill, it's up to a heroic gang of cats and dogs to keep residents safe from harm. A bizarre disturbance leads these four-legged neighbors on a wild-goose chase into the depths of the nearby forest, where loyalties are tested and lives come to an abrupt end. Award-winning comics creators Evan Dorkin (Milk & Cheese) and Jill Thompson (Scary Godmother) first introduced these heroic characters in the anthologies The Dark Horse Book of Hauntings, Witchcraft, the Dead, and Monsters, for which they won coveted Eisner Awards for Best Short Story and Best Painter. 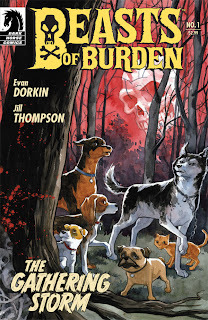 Adventure, mystery, horror and humor thrive on every page of Beasts of Burden -- a comic-book series that will capture readers' hearts and haunt their dreams. The Eisner Award-winning story gets its own series! So, that's what I'm looking forward to today. As mentioned, I probably won't get around to reading these books for a while, but just being in the store will be a nice change of pace from online job searching. Oh, and I might learn how to play D&D this week. Anywho, what are you Waiting for?